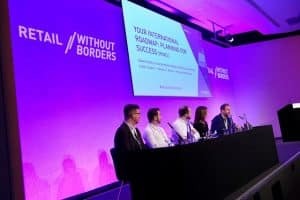 Europe’s largest online marketplace conference, Retail Without Borders, is returning to London’s QEII Centre in March 2018 for its biggest event to date. Taking place on Thursday 15 March, the event will be moving into QEII’s flagship conference room, The Churchill. Providing space for up to 700 delegates theatre-style, the change of room will allow Retail Without Borders to build on the success of the 2017 event and welcome even more retailers for a day of tips, insights and actions to accelerate global sales. Retail Without Borders introduces global marketplaces to sellers, attracting key decision makers from more than 30 marketplaces. Throughout the day delegates can attend ‘quick pitch’ sessions, regional panels, keynote talks and an exhibition. New for 2018 will be marketplace speed dating and a ‘Logistics Lounge’, designed to tackle fundamental issues relating to the delivery cycle, from international returns and global warehousing to passing customs in harder to reach markets.